The report displays the full list of user profiles in a table. You can use the report to evaluate statistics by profile attributes and go to the profile card. To customize the set of columns, click and select the required attributes from the list. The report allows you to pull out certain users by defining data segments. You can see detailed information about a specific profile in the profile card. Click the profile to go to the card. A list of attributes and their values. You can use the profile cards to learn about typical users who complete the target event. You can use this data for advertising and push campaigns. 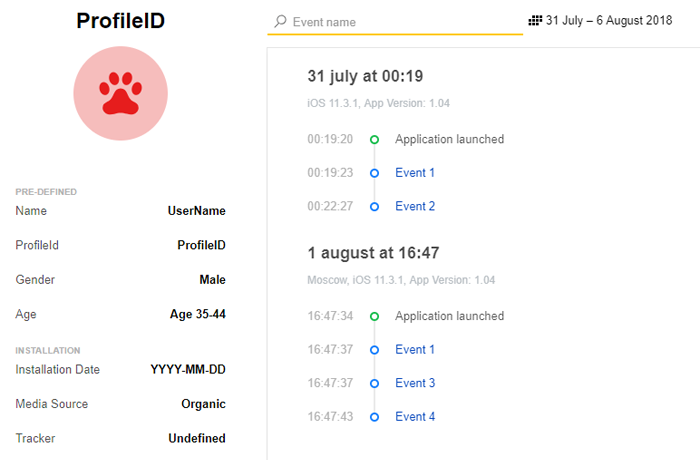 You can also use the event history to understand what helps or hinders conversion and what leads to a crash or an error in the app. Sent custom events that have been configured in the application. Events that have been sent automatically by the AppMetrica SDK: application start, crashes, and errors. The event timeline is displayed for a specific time period (a week by default). The date range can be set via the drop-down element. To view the passed values of the events or the log description, click on the event or error in the list.